Flexible Fiberscopes are very similar to normal Fiberscopes. Much like Video Borescopes, Fiberscopes can be either rigid or flexible. In the RVI industry, when the word “flexible” is used, it often means that the inspection camera is articulating. Fiber optic cables or glass fiber bundles relay an image to the user’s eyepiece. This allows visual inspections of hard-to-reach areas in a wide variety of inspection applications. 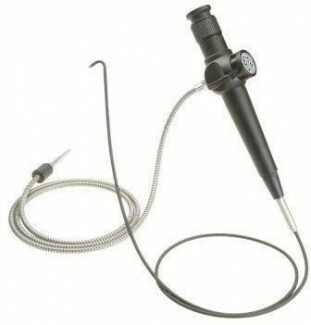 See Fiberscope for more information.